What follows are my philosophical guidelines for mixing jazz records—and I’ve worked on a few, including Eliot Cardinaux’s No Dreams Here (a solo piano record), and Jayme Silverstein’s Gift (you might remember him from an article I wrote on the state of music production in 2017). Indeed, jazz is some of my favorite music to mix. Without further preamble, let’s get into it! This isn’t always the case, but jazz is often organically created: instruments are frequently played live and simultaneously. How this is achieved in the studio can vary. The musicians can all occupy the same room, with clever miking techniques used to localize and separate elements. Alternatively, some instruments can be siloed in their own chambers—drums and pianos most often, though it’s not unheard of for all the players to be walled off, interfacing with each other over headphone mixes. Sometimes a few electronic elements could have their own direct feeds (bass, keys, anything supplying MIDI information); more often, combinations of practices are used throughout a record, as production in the modern sense of the word increasingly touches upon the artform. I would advise you to learn all you can about how the sessions were recorded. It benefits you to know the intricacies of the audio capture, because in many instances you will be hemmed in by the constraints of the session. Here’s an example: If the dull side of a cardioid mic on a stand-up bass holds the bleed from the drums, that dictates how, in panning and in frequency, the two elements will complement each other within the mix. Such attributes influence your decisions regarding these two instruments going forward—for instance, severe compression on the bass might wind up emphasizing unnecessary aspects of the hi-hat, while boosting the high end of the bass might have the beneficial side effect of bringing out the air in the cymbals. You have options at your disposal for securing this knowledge. You can ask the clients how they remember the session going, or you can ask the recording engineer directly; if you’re friendly with the people involved, you can request to see input lists. Of course, you could be in the position of mixing a project you also recorded, in which case you have your own notes. Notice I did not say, “process every track in solo”—we all know that’s a no-go. But at the beginning of the mixing phase, the act of listening to each track in solo will help you get through grunt-work tasks and start your brain salivating over creative opportunities. Let’s start off by properly finishing the previous tip: when you listen to each track individually, you’ll hear its corresponding bleed, which will help you determine how an element needs to be mixed. I usually keep a notepad or a text document handy to jot down notes about bleed and possible positioning. Then I can move everything about accordingly. Moving on to other benefits of auditioning in solo: every instrument in jazz is unique—even two alto saxophones played side by side. This has to due with the player, who has devoted years to the craft. In spending eons locked in a woodshed, an instrumentalist has honed and defined a sound unfailingly unique, even when it’s heavily inspired by someone else; that’s just how human beings work. Auditioning material in solo, you’ll not only glean a deeper understanding of the soloist’s perspective, you’ll also immediately hear any issues/virtues within the recording itself. Clocking problems during recording will rear their ugly heads (I once had a trumpet track from a venerable NYC studio plagued with clicks and pops), as will deleterious frequency buildups. The most important task now becomes carving out and defining space for all the individual elements. This is arguably true for any mix, but with jazz, it’s doubly important on account of the recording restrictions listed above, as well as the larger size of many live ensembles. Sure, pop tunes often boast hundreds of separated tracks, but these sounds have been painstakingly arranged to complement and reinforce each other. With a jazz record, you might have two separate drummers, a five piece horn section, a bass, piano, guitars, and more—all improvising at the same time! With such a spontaneous arrangement, the balance becomes very important. If the tune has a defined arrangement for the head (that’s hip-cat lingo for “the melody”), it pays to give the tune a couple of listens and imagine how the panning and level best suits the arrangement. This may be another case for the solo button: I recommend first listening to the static mix to get the feel of the tune, followed by zeroing in on the melodic instruments, usually underpinned by the bass part; if the melody features a hard bop, tenor sax/trumpet arrangement, perhaps some slight panning to the right and left of center will beef up the mix. But how does that affect the all important bass, which often keeps the time (even more so than the drums)? This invariably influences my next decision: if the bass carries spill from both horns in equal measure, up the middle it goes. If not, some compromise must be made, though personally I tend to favor a centered bass, with exceptions made if a secondary instrument is doubling/complementing the bass part; then, my internal sense of symmetry will let me position these two elements in spatial juxtaposition. Introducing the other elements back into the mix, I’ll pan and level-balance the tune, always keeping signal bleed in mind. Next comes equalization—but here I don’t get heavy handed. Again, the primal rule is still to carve out space, so I have my eye on subtlety curtailing any frequencies taking up unwarranted room. I address issues such as unwanted resonances in snare drums, or frequency masking between two simultaneous instruments. The game consists of pruning out that which is not essential. It’s quite fun: if you have a mind inclined toward solving puzzles, you’ll find this stage most gratifying. As a general yet breakable rule, I don’t use equalization to create new sonic textures, at least, not without the consent or advisement of the primary producer. I am here to preserve the organic, not to wreak havoc upon it! This is more of a philosophical tenet than a technical tip, but I find it works nearly every time a tune has percussive elements. In my experience listening to jazz records, I’ve come to believe that the drums often dictate the character of the mix. Think about the modern crop of jazz recordings, where you’re often dropped into the middle of the band as it’s playing: the shininess and polished quality of the drums amplifies this effect; indeed, the high frequency emphasis brings you closer to all the instruments. If you decide on this approach for your mix, how should you determine the right character for the drums? Two factors will help you right off the bat, the first being the quality of the recording itself. Expansive/expensive drums recorded in relative isolation give you flexibility in shaping the character, and allow you to proceed directly to the next tip. On the other hand, if the drums were recorded with tons of tonal/phase issues and more than a little bleed, you’re a bit hamstrung. First I would massage the tracks into a manageable product, then I’d let the results dictate the tonal quality thereafter. If, for instance, you were left with a powerful sound, but it was lo-fi and trashy, you could use this as your cue for everything that follows. You could downgrade the other instruments to add to the lo-fi feel, or conversely, you could segment the drums into their own rough-and-tumble compartment and contrast them with a more rounded lead section. However you go, at least you’d end up with a cohesive, intentional-sounding mix. Proceeding further, the second tool in the arsenal is better than compression and more useful than EQ—and yet, it requires no plugin and no piece of hardware. I speak, of course, of reference mixes. Plenty of tutorials abound for shaping drums with equalization, or for manifesting sheer power with dynamic processes, but none of them are worth their salt if you don’t know what you’re going for in the first place. So, ask the artist or producer for a reference record, and work towards that goal. If none is supplied, think of a tune whose mix fits the bill. Now, use your ears to get your drum sound in the same general area. Luckily, iZotope has some new plugins for the job: track referencing in Ozone 8 and the Tonal Balance Control plug-in can come in handy. The latter is particularly useful in this regard: find a suitable reference, locate a drum solo (usually not hard to find in a jazz context), export that sample, and load it up. From here you’ll be able to more closely align your drum sound with the drum sound you’re referencing. If you don’t have these plugins, your ears, an equalizer, a compressor, and a spectrum analyzer are enough to get you there. Simply go back and forth between your mix and the reference track and hear/see the progress as you work with your usual processing. You might not need a reference track if you can picture the sound you’re going for. Still, I’d recommend using one to make sure you don’t lose perspective while you’re mixing. If you’re going to implement compression, expansion, or reverberation, I would first try these tools in parallel before affecting the track directly. The reason harkens back to the live quality of jazz music: all of these instruments are playing together as one cohesive piece, with dynamics and spatial imaging very much contributing the feel of the music. Direct manipulation of a track might very well upset the balance of the bleed, or pull the element itself into an unnatural space separated from its surroundings. As a general/breakable rule, think of compression here not as a means of curtailing dynamic range, but as an envelope control on the transients and ambiance of a specific sound. Perhaps the drums could use more snap to them; the inclination to reach for an 1176-style compressor with a medium attack and a fast release is not necessarily incorrect. It’s the application that might prove problematic. By bussing the drums out to an aux and emphasizing the snap there, you can exert more control over level of the effect; you’ll be surprised at how little you’ll need to give the drums your desired edge. A plugin might have a mix knob for this express purpose, but I’d still avoid it, because raising fader levels in the mix window is a much more intuitive way of instantly balancing a tune than opening a plugin and tweaking the blend knob (at least, in my experience). You also run the risk of influencing all downstream processing by using a blendable insert, whereas a buss will carry all of the track’s processing. 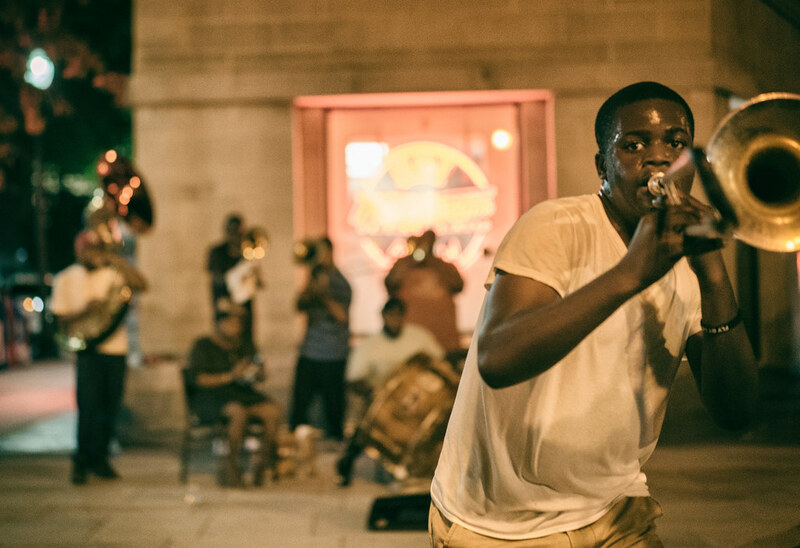 The converse is true: say you want to hear more air, spit, and sizzle around the trumpet. Compression utilized to emphasize ambiance is also better served in parallel, as you don’t incur the same mix-altering penalties of an insert effect. Do you think the jazz-fusion artists of the 70s and 80s intentionally set out to make records that would sound dated in twenty years? Probably not. To be fair, it’s also not likely that the people behind Blue Train set out to make an album that sounded timeless (they just wanted to blow over some changes, daddyo!). Yet both of these examples are indisputable exemplars of the above concept: Esoteric effects and flavors du jour have a way of coming back to bite you years later. Still, like the jazz musicians in the recording, you do want to experiment; it’s part of the medium, and part of the fun. How do we combat the problem of dating ourselves? I’d say the answer lies in listening to the music and letting it dictate the decisions. If a sax player is using breathy techniques to mimic the sound of a flanger within an already esoteric tune, it’s not unreasonable to augment or complement that effect with studio trickery. It certainly doesn’t hurt to try it out. Just sit with the results of creative implementation for a while before sending the track back to the band: you want to make sure it helps. Yes, the loudness wars have had an effect on jazz records too. Compression used in its most aggressive forms—particularly on the drum buss—contributes to audible distortion on many modern jazz records, as does cross pollination between genres. Borrowing from popular genres is nothing new: Jazz has always drawn from other musical wellsprings. Unfortunately, much of today’s mainstream music has moved into an undeniably aggressive sound, which leads to problems when incorporating this music in a jazz context, especially over streaming. Here’s the thing: in today’s pop songs, I’d wager you don’t hear as many acoustic ride or crash cymbals as you used to. The percussive sounds tend to be more electronic and distorted, and as a result, engineers get away with more when confronted with lossy codecs. A hallmark of most jazz records, however, continues to be the cymbals, often made extra-atmospheric with the addition of rivets. These cymbals are some of the first sounds to suffer when pushed hard into a codec’s algorithm. Other acoustic instruments also bang their head against a codec’s ceiling; the horns, in particular, are quite susceptible. As you might be called upon not only to mix but master the final product, I’d advise you to keep all this in mind throughout the process. Many consumers these days will be streaming the resulting record, and even at 320 KBps there can be audible distortion (particularly noticeable in the cymbals and brass) when elements are pushed too hard. You’re going to need tools to translate this language into actual mixing terms. This is a hard area to navigate. The best tips I can advise are references, patience, and copious notes. References help you establish what the adjective might mean (“can you give me an example of a tune where the kick sounded ‘purple?’”). Patience helps you keep your cool as the artist sits over your shoulder and responds to you tweaking the sound over and over again. The notes are equally handy: for my “purple” client, I have a sentence that reads “purple = boost 300 and 2 kHz; purple = flubby and papery.” It has since come in handy. Politics exists across all musical genres, but it’s perhaps more daunting in jazz, because the world is so rarified. You must be aware of the dynamics that exist between members of the band, artists and producers, and even relationships with certain studios. The problem could rear its head if you have multiple people pulling your mix in different directions. You must delicately impose boundaries to get the band to agree. Likewise, if the record features a producer you don’t like, or goes out to a mastering engineer you don’t care for, bite your tongue; there is, in my experience, a reason people use specific practitioners, even if they’re terrible. They might have recognizable names, and in many cases, connections to promotional outlets or touring opportunities. These are things the client would like to make use of. It always pays to keep your cards close to the vest when it comes to criticizing your peers, but never have I found this to be more true than when working within the often insular world of jazz and free-improvised music. As is the case with live projects, the biggest thing to remember about mixing a jazz record is that you are not there to stamp your sound onto the proceedings, but to interpret the music of the artists as best you can. The best jazz records aren’t remembered for the mixing moves; indeed, some of the worst jazz records actually are remembered for this. Instead, look at mixing jazz as an opportunity to serve music in a pure, egoless way. You are utterly beholden to every note presented to you; unless directed by the client, there is no editing or reshaping the arrangement through muting channels. There is only you, and the night, and the music.